In the Wild Nineties, Moscow’s Metropol Hotel was the place to be for expats, who would dine in an elegant subterranean restaurant called Teatro. Here Jennifer Eremeeva recreates her favorite Teatro dish from those turbulent days, pasta with smoked salmon in a vodka cream sauce. Recent events in Russia have left me pining for the Wild Nineties. I’m not sure why. Maybe it’s because I was younger and more fancy-free then, or maybe I was more optimistic and hopeful about life in the New Russia. Things were simpler back then; scoring a roll of toilet paper was an adventure: a carefully calibrated maneuver, necessitating a visit to the Metropol Hotel to snitch one from one of the public washrooms. The poor old Metropol has since plunged downhill in the wake of more serious five-star competition, but in the Bad Old Days, it was expat Ground Zero. Everyone lived and ate there, in an elegant subterranean restaurant called Teatro. Sadly Teatro is no more - it morphed into a tacky nightclub for murky, C-list criminals. But in the 1990s, before the ruble was convertible, Teatro was a wildly extravagant “hard currency” restaurant, and for me it was a major treat reserved for only very special occasions. 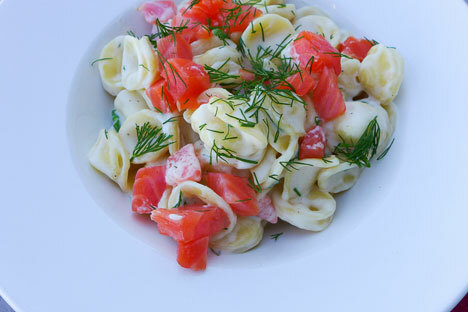 My favorite Teatro dish was pasta with smoked salmon in a vodka cream sauce. This dish has since been recreated endlessly in Moscow’s burgeoning restaurant scene, but at the time, it seemed a very odd combination for Russia. Russians like HRH (my Handsome Russian Husband) grew up believing that pasta was a distinctly lowbrow side dish: infinitely inferior to potatoes. The only pasta dish to earn a place in classic Soviet cuisine is “Makaroni po flotsky” or Naval Pasta: an unappetizing mush of ground meat, no sauce, and elbow shells. It was never anyone’s favorite dish. But then HRH and his pals met me, and they proceeded to eat a lot of pasta during those lean perestroika years. Food supplies were erratic and often limited, but the ingredients for Teatro’s signature dish were generally available. Smoked or salted salmon was always plentiful: Preserving fish by either smoking it in a special smoke house over a smoldering fire of woodchips or curing fish fillets in sugar and salt is a time-honored culinary tradition in Russia that dates back centuries. Twenty years later, I think it is appropriate to nominate Pasta Perestroika for a place of honor in the canon of “Federal” (1991 to the present) cuisine. This period will, I feel sure, be remembered as a time of great creativity and innovation, much as the Imperial period produced so many significant dishes from the kitchens of Russia’s Francophile aristocracy. The Federal period will be remembered as a time of rediscovery and renewal of the integrity of traditional ingredients, recipes, and flavors. We will remember it for its vigorous experimentation with new cooking methods, its move towards healthier food, and its enthusiasm for local products, as well as the exploration and incorporation of aromas and seasonings from around the globe. Hats off to the Federal chefs who have so successful fused all of these innovations during one of the most exciting epochs of Russia’s culinary history! Fill a pot with cold water. Add the olive oil and salt. Bring the water to a rapid boil, then add the pasta. Reduce heat to medium and cook for 12-15 minutes until al dente, or still slighty chewy. Decant ½-cup of the pasta water and set aside. While the pasta is cooking, melt the butter in a small saucepan. Add the heavy cream and whisk to combine. Gradually add the cheese, stirring with a whisk or a wooden spoon to combine the cheese into the butter/cream mix until it is thoroughly incorporated. Add the vodka and cook on low heat for 2 minutes. Add the cayenne peppercorns and set aside. Drain the pasta in a colander, then return it to the pot over medium heat. Add half of the pasta water and finish cooking the pasta by tossing it with the water. The water will gradually mix with the starch of the pasta and evaporate. Add more water as needed. Add the cream, butter and cheese mixture and toss until the pasta is thoroughly coated with the sauce. The vodka will evaporate as the sauce cooks for an additional 1 minute over low heat. Add the salmon and scallions and toss to combine. If you crave a little green with your pink and cream, by all means consider adding a vegetable element such as new peas, baby asparagus tips or diced zucchini. Jennifer Eremeeva is an American writer who has lived in Moscow for twenty years. She is the author of Lenin Lives Next Door: Marriage, Martinis, and Mayhem in Moscow.